I've always had crafting or art in my life. My father obtained is BFA when I was in grade school and I went to school on the college campus. I spent my afternoons when school got out hanging out in his studio classes. I got wide exposure to all kinds of arts. 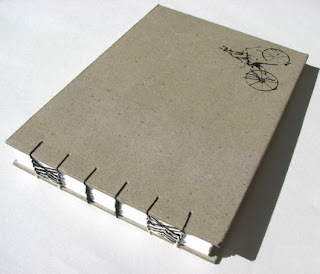 Bookbinding came to my life while I was trying to decide what kind of librarian I wanted to be when I grew up. Etsy came into my life via my husband. We both read a blog named Kotaku and from time to time they post video game related Etsy listings. I had always looked at those but had never spent much time on Etsy. For Valentines day my husband bought me two stunning necklaces off Etsy, and I started to look more at it. A week or so later my shop opened. Mostly personal. I was making books as gifts and for my own personal use, but I had never tried to sell them before Etsy. I also used to do a lot of crocheting. I was a member of my local book arts group and shared my projects there. I do, I work for a Fair Trade Handicraft African Imports company Named Swahili Imports. I love what I do as I spend my day helping and promoting people making a living through their own crafts in Africa. My shop is a bohemian wonderland of books. What you'll find listed changes depending on what I felt like making in the last bit. It will almost always have some mini photo albums & Celtic Weave books in there, but I can't promise anything beyond that! My husband doesn't help directly but he's a huge help! He makes a great bouncing board for ideas and is great for "which picture do you like better?" as he gives me his honest opinion. He won't help me with anything else, he's claim's he's not artsy and doesn't want to mess anything up. For the crafting world, enjoy what you do. When it starts to feel like production work you need take a step back. I think my best advice for Etsy is that you get from Etsy what you put into it. If give constant attention to your shop, ie listing often or renewing, good pictures, good promotion, then you can get a lot of our Etsy. If you devote smaller amounts of time you will get smaller results. I have been known to do a local craft show but I don't have my work in any local stores. Is that a paper store? 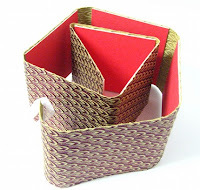 I got interested in bookbinding while researching where in a library I wanted to work. I spent my undergrad years working in the campus library and knew when I finished that I wanted to continue on and get an MLIS. I had a good idea of what I didn't want to work in so I started exploring the other areas I knew little about. I eventually found my way to the conservation lab and knew that’s where I wanted to be. 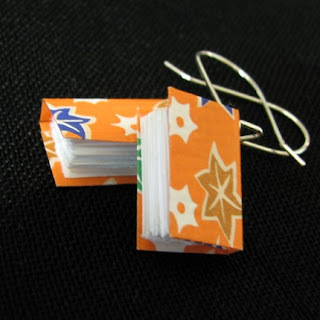 I took a bookbinding class to make sure and I was hooked. I've been crafting for as long as I've had the ability to use my hands. I've been making books just shy of 3 years. I don't really have one, that’s one of the things I love about bookbinding is that is so diverse you can make a million different books all with different bindings. There are so many bindings and so little time. I guess if I really have to pick a favorite right now it would be the Celtic Weave although I'm really starting to enjoy playing with long stitches too. My paper knife, I use it for binding and screenprinting. My favorite materials are a good quality paper for the text block, my chunk of local natural bee's wax, unwaxed thread, and a really great piece of Japanese paper. Almost anything. A great piece of paper, a color theme, or my mood. I just start digging in my paper stash or ribbon stash until I find something that I want to use for a starting point. I know this is a cliche answer, but it's my Mom. She got me started with crafting and has always encouraged my creativity in anyway she could. She drove me to 4H meetings, put up with my crazy requests for materials, and I'm sure she still has a closet full of my old crafting projects half done.